One year after finding vengeance for his murdered brother, MMA champion Kurt Sloane finds himself back in Thailand kidnapped and imprisoned there by a powerful gangster (Christopher Lambert). His only shot at freedom is to win an underground death match against a 400lb killer enhanced with state-of the-art drugs (Game of Thrones’ Hafþór Júlíus Björnsson) . To make it out alive, he seeks training unlike anything he s ever endured, with the help of the legendary Master Durand (Jean-Claude Van Damme) and fellow prisoner Briggs (Mike Tyson). 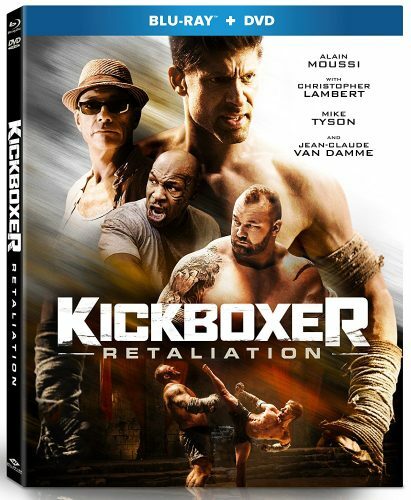 Kickboxer Retaliation is the sequel to the remake of Kickboxer we got in 2016 called Kickboxer Vengeance. Still starring are main lead playing Kurt Sloane with Van Damm coming back playing the trainer. We also have Christopher Lambert and Mike Tyson making a small appearance. The film follows Kurt Sloane one year after the events of Kickboxer. He joins the MMA Scene but after a being drugged he is taking back to Thailand to face the super huge Mongkut. The Story is small but its an OK follow. The action was fun with that MOVIE believable portions like dying or getting close to it after each round in a fight and coming back. But that’s what makes it kind of that on the edge of your seat feeling. Of course, we see some spots that could have been changed like why doesn’t are lead cut the legs of his opponent when he is right next to him with knives attacked to his elbows? Also, I do wish the action had more open scenes and not a ton of close up action. Overall the film was fun as a popcorn film and you should know that it’s that type of film. It’s not going to win awards but maybe for Van Damm’s Crying Scene or maybe not. Speaking Van Damm, I felt his role in this sequel was almost nonexistent. The end Fight was fun a long and if you’re into Action B-Movies, you should enjoy this one. Both films though don’t hold a candle to the Original classic.